If you wanted to link two small engines to a common driveshaft, how would you do it? Here are the options I can think of. 1) couple the back of one engine to the front of the second engine. 2) connect each engine laterally to a common shaft and engage then independently. 3) connect the engines in a similar manner to a crank and cam using a gear and chain configuration or gears only. Which method would you think would work best or do you think another option would be better? 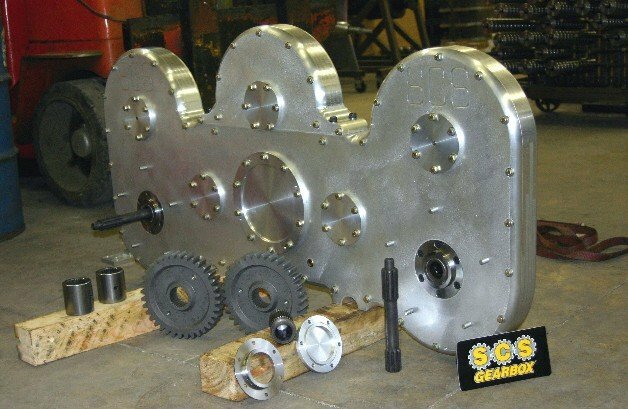 Connect the engines crank to crank or side by side with gear boxs. Either way timing of the engines is critical. Why is timing a factor? The flywheel is ignorant of the position of each piston. I can see how the RPM’s need to be synchronized. So if I’m using two single cylinder engines, I actually need them timed 180° from each other. Common is 45° it makes them kick back on the started alot less likely. If I were using vertical shaft engines and oriented them like a boxer engine, they should be 180° from each other. I'm thinking I'd have one of the motors connected with a belt drive so any asynchronous vibrations would be absorbed by the belt, not either engine. A broken belt is easy to replace. Or maybe I'm just overthinking it. Or you could go full Brit grade bonkers and join two Jag 24 valve straight 6 engines together end to end!! This was more along the line of what I was considering but not for vibration control but to keep each engine isolated from the driveline by using a sprag. If I use a central driveline and connect each engine to it using a chain and sprockets with a sprag on one of the sprockets. Keep in mind I’m talking about linking small engines, not car engines.